With the first quarter of the year done and dusted, the winds of the perfect storm continue to blow in the tenant’s favour. Shaun Dawson, Head of Insights, comments on the central London office market in Q1 2018. Given a continuing backdrop of Brexit brouhaha, economic despondency and of course a couple of blasts of cold weather thanks to the ‘Beast from the East’, you would be forgiven for thinking that the first quarter of the year would have been more of a stutter for the property market than actually transpired. Q1 2018 recorded a robust amount of demand, plateauing of availability levels, minimal movement in rental prices and a gradual squeeze on the supply of Grade A space. Each of these factors and the varying pace at which they are impacting the market are not only influencing a business’s decision to commit to office space in central London, but also the type and volume being taken. The leasing of office space across central London reached 2.6 million sq ft in Q1 2018. Whilst this figure is in-line with the long-term quarterly average, the significance lies more with the buoyancy of demand, especially hot-off-the-heels of an extremely strong end to 2017. Demand in 2017 reached 13.4 million sq ft, boosted by 3.7 million sq ft in Q4 – the highest quarterly volume since Q3 2014. This is a sign of improving business confidence, compared with what we saw in the post-referendum slump of 2016. This is also reflected in a number of long-running business sentiment indices such as those by the Institute of Chartered Accountants in England and Wales (ICAEW) and Deloitte. Both of which point to a strengthening of confidence amongst business leaders in Q1 2018. The drip-feeding of the agreed points from Brexit negotiations has in part led to an increase in optimism (or less pessimism) among businesses. Clarity on issues such as; EU citizen rights, the transitional period, ability to strike trade deals and the potential value of any divorce bill, have given people something to base decisions on. This includes real estate decisions. However, for a good number of firms, the question of wait-and-see is not a luxury they possess, with expiries and breaks forcing their hands to commit sooner rather than later. Whilst leasing activity in Q1 was down on the previous quarter, some areas of central London did see an increase in letting. Those areas included Victoria (+56%), Docklands (+49%), Mayfair (+25%) and St James’s (+5%). The number of letting deals in Q1 2018 was 20% higher than the long-term quarterly average. The leasing of spaces at either end of the scale is noticeably different to recent trends. At the small end, the number of office spaces less than 6,000 sq ft totalled 324, representing an increase of 22% on the previous quarter and the highest number since Q3 2011 (370). However, at the other end of the scale, the number of spaces leased that were larger than 50,000 sq ft totalled six for the quarter. This is equal to the longterm average. It does however highlight a decrease on the 11 that were recorded in Q4 2017. Early indications suggest that demand for larger spaces is by no means dwindling with 9 such lots totalling just over 1.6 million sq ft have been placed under offer by tenants. Take-up of office space in Q1 2018 was driven by financial firms representing 23% of leasing activity. This level surprises some, especially as Brexit continues to loom large over this sector. Nevertheless, firms taking space range from pre-lets in the City by overseas banks to hedge funds and asset managers continuing to commit to offices in Mayfair. This would all suggest that it’s business as normal but not quite so. The Corporate sector, which features a range of businesses from retailers to holding companies, represents 19% of leasing activity in Q1. It is within this occupier sector that serviced office providers are included, representing 5% of the total leased for the quarter. This follows 2017, a year in which providers of flexible workspace took the market by storm, leasing over 1.5 million sq ft (12% of the total). Whilst this part of the market has been gaining press attention, it has also gained significant occupier interest in the process. The growth in the provision of flexible office space looks set to disrupt the conventional leasing market on a number of fronts, not least of all with the range of occupiers that are attracted to this offering. This is especially as space being offered by providers is some of the best Grade A. Technology firms continue to commit to swathes of office space across London, accounting for 16% of letting activity. The majority of space for this group was taken in and around the City, with preference for the increasingly popular fringe areas. However, a growing number of firms are recognising the benefit of City core locations. In part to be closer to clients and a greater level of connectivity. This trend is expected to continue, not least of all because of the amount and choice of Grade A supply over the next few years, the size of floor plates and perceived value. 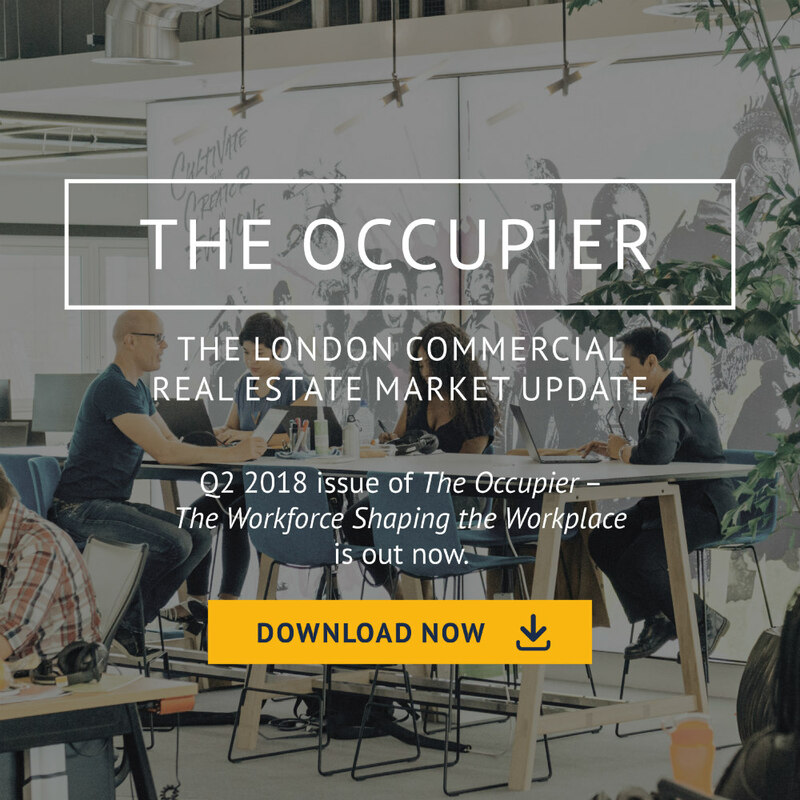 The volume of available office space across central London recorded a decrease of just 1% at the end of Q1 2018, bringing the total to 16.2 million sq ft. On face value this movement is hardly a momentous shift, but the significance lies with the fact that it’s the first time in two and a half years we have not seen a rise. This is despite an average volume of letting for the quarter and a number of development schemes reaching completion. Have we passed the peak in availability? Unsurprisingly, the answer is not as clear cut. Contrary to the downward movement recorded for the central London market as a whole, some submarkets have seen levels of available space increase over the quarter. The Southbank and the West End have both recorded rises in available office space, 30% and 6% respectively. Across the City, however, its level has stagnated at 5.7 million sq ft (still at the highest since 2014). Submarkets such as Midtown and the Docklands have seen availability levels fall over Q1. Even some areas in the West End are seeing decreasing levels of supply. The North of Oxford Street area as well as Victoria have both recorded a drop over the quarter. This downward trajectory may well be the start of things to come, yet we remain mindful that total availability is 14% higher than at the same point in 2017. In addition to this, there is approximately 2.5 million sq ft of available office space that is still under construction and due to be delivered in 2018. Should leasing in the remainder of the year not maintain average volumes, we will indeed see a swift upward swing in availability (geography dependant, of course). Prime Grade A rents across central London submarkets grew by an average of 1% over Q1 2018. Despite this, the majority of locations saw no movement of rents over the quarter, just a few outliers saw increases, such as the western and northern fringe areas of the City, 3% and 5% respectively. The prime rent for City core remains at £68.50 per sq ft for the 4th quarter in a row. In the West End, all areas but Camden (14%) have seen no movement in rents. Mayfair/St James’s continues to command £125.00 per sq ft for space at the top end. While no movement in prime rents in Midtown have been recorded over the quarter, rents are now 4% lower than those a year ago, at £67.50 per sq ft. South of the river, Grade A rents have moved out by 5% to £72.50 per sq ft as the availability of prime space is eroded. Grade B rents have also moved at the same pace (1%) over the quarter, notably King’s Cross Grade B rents have moved out by 4%, now at £65.00 per sq ft. This is not only the highest level recorded for this area but also continues an unbroken rise in Grade B rents since 2011. IS THE PERFECT STORM FOR OCCUPIERS STILL BREWING? In our previous edition of this report we discussed how a perfect storm of conditions were coming together to potentially skew the market in favour of the office tenant. It is clear that those conditions (economic, political and business uncertainty) are all still in play, albeit to varying degrees of influence. An easing of business uncertainty over the past six months has led to a period of buoyant demand, not least of all for Grade A space which accounted for 44% in Q1 2018. This is now leading to certain areas showing a declining volume of Grade A space coming through to satisfy tenant requirements, prompting some developers to ready their schemes for construction start. Whilst the impact on rental levels is not yet being felt, we are at the point when early discussions with a developer/landlord could be advantageous for occupiers in order to secure the right space, in the right location. The minimal movement of Grade B rents over the quarter, coupled with some generous rent-free periods, and the fact that the availability level of this type of space is high, plays into the hands of a negotiating tenant. Add into the mix the competition from the surging provision of serviced office/co-working space and landlords are recognising that flexibility in both approach and terms will be key to securing a tenant. With the first quarter of the year done and dusted, the winds of the perfect storm continue to blow in the tenant’s favour for the time being. For more information, contact Shaun Dawson on sd@devonocresa.com. You can also watch the video below.